After reading the Video Game Critic's review where he was really complaining about the speed the miner moves in this version, I thought at least this point should be easy to fix. After digging a bit deeper into the code, I have to say whoever programmed this game had little idea how to code for this console. The code is extremely bloated, each level is almost completely coded separately. It is highly inefficient, with lots of subroutines inside the kernel, which also shows heavy tearing (look at the enemy feet!). No surprise that the graphics and sounds are so simple, the game play is sluggish and the game still requires 8k. The programmer obviously wasn't able to do any better! Additionally it displays a different number of scan lines for each level (258..265 in NTSC, 312..320 in PAL). Vol 2 is even worse, the NTSC scanlines are not even constant in a level and in level 1 the torch is flickering up and down. Quality control must have been lousy too. I wouldn't be surprised if this is an early bad example of offshoring. I am pretty sure Vol 1+2 with better graphics, sound and game play would have together fitted into 8k if someone like e.g. David Crane would have done the game. Someone who is a fan of this game should do a remake. And here are Volume 2 and the PAL versions patched for speed too. Don't forget to enable phosphor (ALT+P). Edited by Thomas Jentzsch, Sat Sep 7, 2013 4:03 AM. Great idea speeding these up! 2600 Burgertime is another one that would benefit from such a hack. Characters could use a redraw too come to think of it. Edited by save2600, Sat Sep 7, 2013 9:39 AM. Thanks. I think I may have noticed the bug before, but didn't care because the game is so lousy. Agreed! I would love to see a tweaked version of Burgetime. Edited by xybot67, Fri Sep 13, 2013 11:52 AM. Thanks for sharing these. Maybe the game will be playable now! I think the jumping needs tweaking too. Loved what you did on this. I'm currently looking into graphical hacking this. Thanks for the work on this! Do these games only have three levels? Any way they game one and two can be combined? Edited by doctorclu, Fri Aug 17, 2018 7:05 AM. Yeh I realize this was 5 years ago... I honestly didn't know Miner 2049er for the 2600 was a thing till I found it in my directory on the Retron 77 last night. Loved it on the Atari 800. Basically while I loved many games on the Atari 800, I can immediately rattle off Star Raiders, Archon, Choplifter, Mr. Robot and his Robot Factory and you guessed it, Minter 2049er as my go to games. And Return of Heracles for long play. hahaha!! Thanks for speeding it up a little bit. Helps. * Previously un-released, only one animation sprite altered. * Sprite with the miner helmet pulled over the eyes. * Eyes are shown/helmet raised, changed font, green/glowing enemies. * Enemies made smaller to make easier to jump over. ** As they can be lost in the following message traffic and I don't have access to the first message of this thread. Which is fine, I'm glad Thomas made the speed up adjustment for this game. 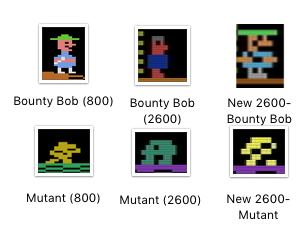 I played with this today, working to change the sprites to make the main character, Bounty Bob, look more like his Atari 800 self. Rom is based on the faster version. The original Bounty Bob on the Atari 2600. Finding the sprite. Pretty cool, sorta. 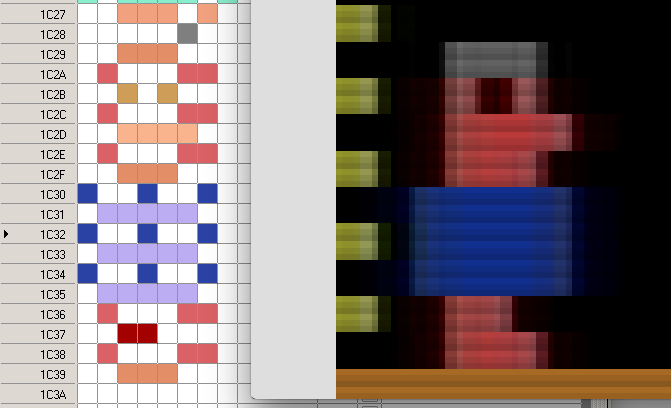 You get a line of sprites, then the color definition the line above that. Just wish the line was not doubled, Could have done more with that, like we saw with Bubsy and Fast Eddie. Enjoy, more to come as I try to change the sprites to something more of the Atari 800 version. Right now I am happy Bob has a helmet with a brim. That is what started this: Bob needed more of a hat. Also happy that Bob is more of a rounded body with the short legs that are not too animated. It actually made sweeping the platform contents easier. The way this hack is, the helmet is pulled down over the eyes. I have a missing pixel in the front of the helmet to give the appearance of eye.. or a helmet light. Thinking of filling in that pixel though. And might fill in the pixel for the buttcrack while he is climbing ladders. I just added that for fun while in development. Anyway, I get 9 lines to work with so let me know what suggestions you may have to make this better. Edited by doctorclu, Sat Jan 26, 2019 7:06 AM. Some minor updates to Bounty Bob that I mentioned above. Edited by doctorclu, Wed Sep 5, 2018 6:50 AM. * More of Bounty Bob where he now has an eye along with his smile. Had to loose the top part of his hat to do it, but the whole hat shows up when he jumps, slides, and falls. * Mutants look more like glowing/flashing mutants! * Mutants turn green instead of yellow and look more friendly when you grab prizes. * Font set adjusted to be more Atari 800-like. Slight update to the first volume and volume 2 with the Atari 800 sprites. Ok bear in mind I learned about this version of Miner 2049er just a few days ago. So tonight I was looking at other references to this game and there is a lot of hate for it. I can kinda see why. Again, was impressed by what it COULD do, and hopefully now the sprites look more in line with what we expect of Miner 2049er. But there are two things I would like to see happen with this game in the more immediate future. Speeding this game up was a wonderful touch. 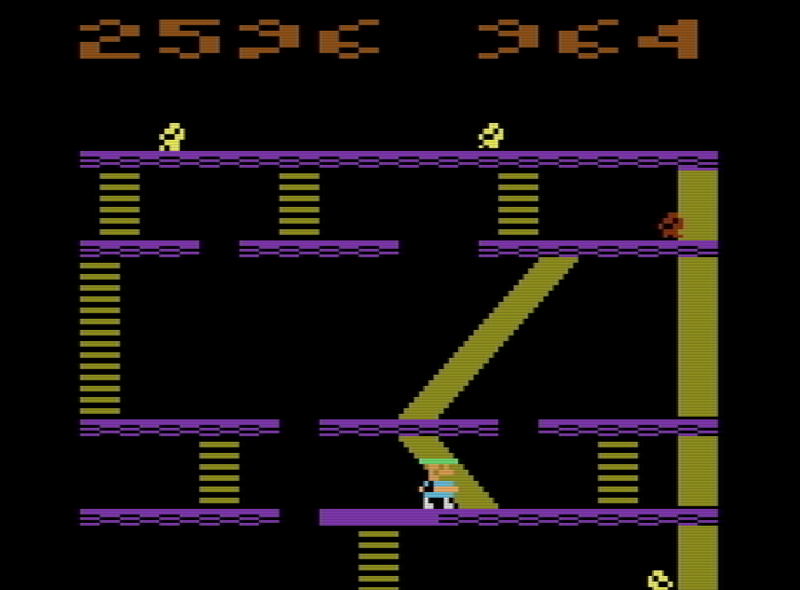 The character now moves at something closer to the Atari 800 version. Aside from somehow combining Volume 1 and 2 into the same game, here is what else needs to happen... the level needs to not reset the progress when you die. Yes yes, I just played the Atari 800 version and it resets the levels when you die and you have to start over. But... yeh, that could be the trade of between the two versions. 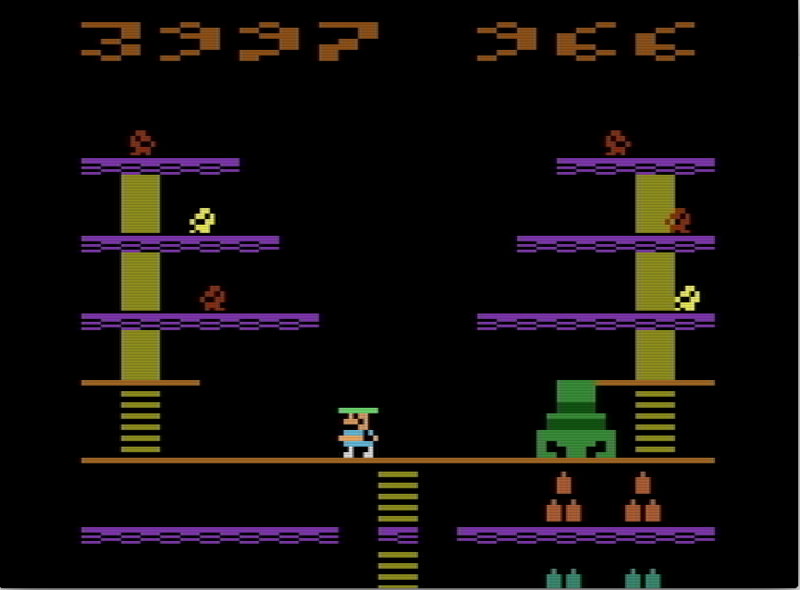 The Atari 800 gets the more fluid gameplay, and the Atari 2600 version gets not as smooth gameplay, but doesn't reset the progress making it a much more enjoyable game. Have to decompile this at some point and see if there is a clear command on death... and remove it. Edited by doctorclu, Sat Aug 18, 2018 11:36 PM. Thank you OmegaMatrix (where ever you are... loved many of your hacks), I have combined your reset bug fix with Thomas Jentzsch's speed up version. I'm adding this version for the purists who like the original sprites. Edited by doctorclu, Sun Aug 19, 2018 1:01 PM. The faster, reset fixed, and sprite improved Version 6 !! Added the updated glow effect where the mutants now don't all flash in unison. If this gets to be too distracting, just let me know. Now to figure out how to keep the game from resetting your progress on a screen when you die. So I played this a bit more, got past the first and second screens, and when I got to the third level (cannon level) where before I didn't have to jump over the mutants as much and could take them out with the prizes, the cannon level you have NO PRIZES. 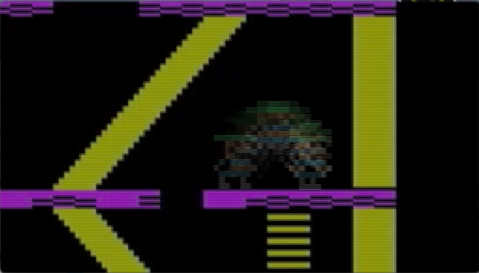 And it was then I realized how difficult the mutants were to jump when you had to do it more than once. So I played with jumping over mutants, tried various sizes of mutants, and tried to see about the jumps. If I couldn't improve jumping itself, maybe I could make the mutants more reasonably sized to jump over? What you will see in the videos below, especially the block mutant one, is that the hit detection is forgiving on the front end of the mutant if the mutant is heading towards you. That is, unless you just flat out run into the mutant. Jumping over a more "reasonably sized" mutant. Jumping over a block mutant. I finally tested a mutant with no pixels and just walked right through the area where the mutant was. So a more reasonably sized mutant actually does help. So that said, version 7 has all the previous improvements, and more reasonably sized mutants to Bounty Bob's jumping ability. Edited by doctorclu, Mon Aug 20, 2018 6:20 AM. Today wanted to get a visual of the jump effects for the 800 and 2600 Bounty Bobs. Edited by doctorclu, Mon Aug 20, 2018 6:25 PM. Looks like jumping distance is half. 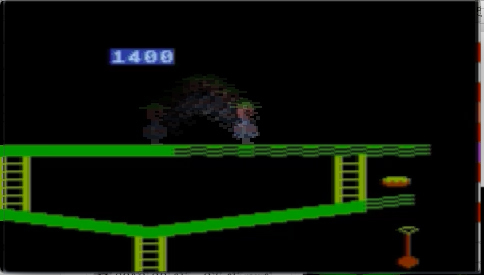 No wonder it's almost impossible to jump over things in the 2600 version. No doubt. You should try it with the smaller mutants though in the latest version above. Still requires you jump while they walk straight at you, but more doable. When I got past the third level I found the game repeats WITHOUT prizes. Since it became all about jumping over the mutants I was suddenly glad I made them smaller. Oh, and on the third level the second time, they only give you one set of dynamite with no spare. How nice. And in case you're wondering, save states in Stella (and on the Retron 77) are a game changer here. Edited by doctorclu, Mon Aug 20, 2018 8:12 PM.